I didn’t grow up in a bustling kitchen with a plump mother and grandmother teaching me to cook to exacting family standards. In our house we inclined more to canned ham and Potato Buds. So my cooking imagination can be let’s say a bit on the arid side. But so what! These days, we have “virtual grannies” of every ethnicity, region, and cuisine clamoring to teach us their kitchen secrets. Cookbooks! Cooking classes! TV shows! Sites! Blogs! Mobile apps! There’s a whole world of food knowledge out there to draw on. 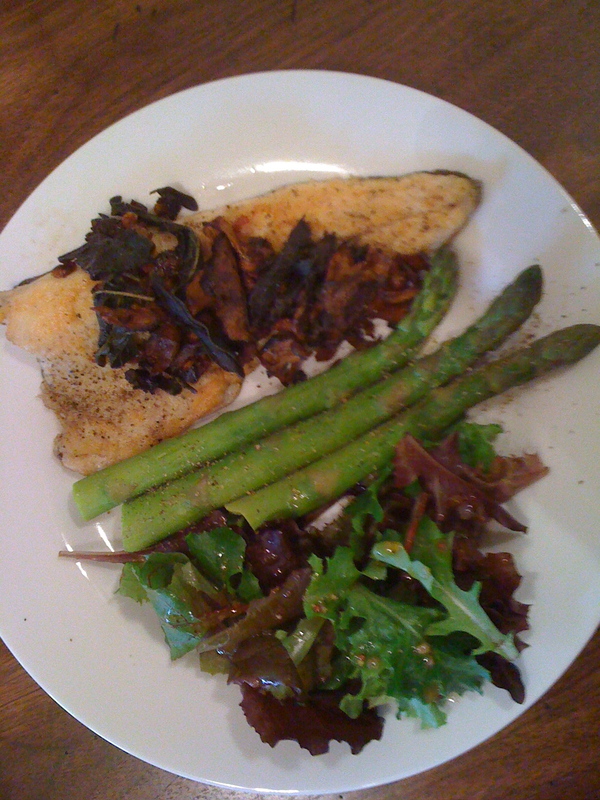 In fact, just this weekend, I found myself pulling together what was probably my most “informated” meal so far. So I headed off to buy my fish. 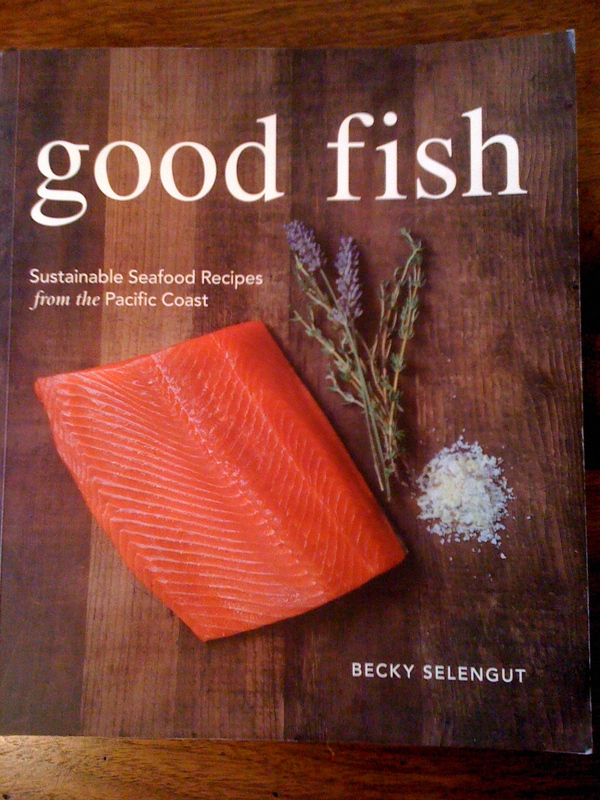 But the whole point of Becky’s cookbook is that we should buy sustainable fish!–Very much in keeping with my commitment to mindful munching. And here I am at the fish counter, looking at the one choice of “farmed rainbow trout.” The cookbook is at home; so, where are we on farmed fish, again? The recipe calls for a garnish of fried bacon (diced), mushrooms, and sage leaves. I bought some bacon when I got the fish. I already had a little package of dried chanterelles, so I reconstituted them to use, and I have a sage plant out in my garden plot where I got some leaves. To make it a meal, I got some nice fat asparagus (to me, much better than those skinny spears), which seemed like a perfect match for the bacon-y garnish. Add a little green salad with a simple vinaigrette. Satisfying! And prepared under the guiding hands of my pocket Granny! Do you have a similar knowledgeable online tribe that you consult for your cooking?–Share your favorites! This entry was posted in Recipes and tagged apps for cooking, cooking fish by judyramey. Bookmark the permalink.